UPDATE 12:53AM DECEMBER 12: Go HERE for a full update including video of the stolen cars leaving the area and info on a third robbery nearby. Our original story follows. Cops are on the hunt after two carjackings were reported just minutes apart near Roscoe Village on Monday evening. Investigators believe the same crew is responsible for both robberies. At 8:05 p.m., a masked gunman approached a woman and took her 2011 Porsche Cayenne in the 3200 block of North Hoyne, police said. The car, which bears a license plate beginning with K911, was last seen heading southbound in the east alley of Hoyne. Police believe the robbers ditched the victim’s phone near Hamlin Park to prevent GPS tracking. 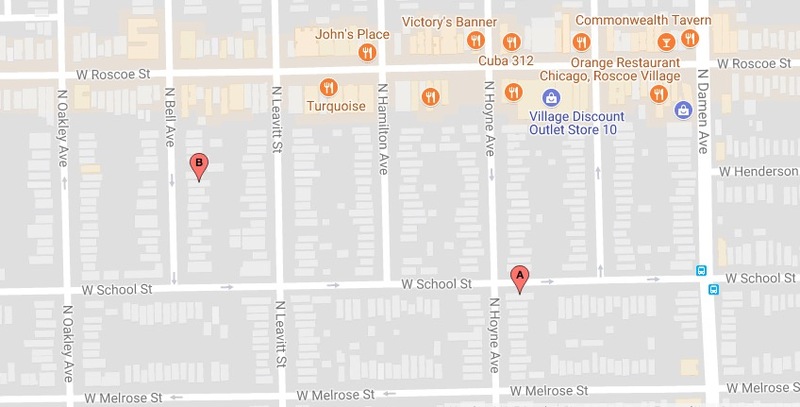 Less than five minutes later, a man walked into a wine store in the 2200 block of West Roscoe asking for help after he was carjacked in the 3300 block of North Bell. Once again, the offenders had covered their faces and both brandished handguns as they took the victim’s red 2014 Dodge Dart and fled south. The second victim’s car has a gold racing stripe on the side; gold and black rims; and it bears a license plate that begins with AJ693. Police said the offenders are men in their early 20's, black, wearing ski masks or scarfs over their faces. One ski mask has detailing around the eyes and mouth. One offender is about 5’10” tall, has twists in his hair, and was wearing a red and white letterman-style jacket. He had a blue steel handgun. Another is about 5’9” tall and wore a gray hoodie or black hoodie with writing on the front. There is likely to be at least one additional offender, a police source said.